Albeit he hasn’t signed all the current players in the Man City squad, but a study has found Pep Guardiola has the most expensive assembled squad in the Premier League. Ederson, Kyle Walker, Bernardo Silva, Danilo, Benjamin Mendy all arrived at the Etihad last summer, while Aymeric Laporte broke the club’s transfer record with his £57m move in January, as per BBC Sport. On top of that, John Stones, Leroy Sane, Gabriel Jesus and Ilkay Gundogan among others have also all been Guardiola signings and so significant money has been spent since he was appointed. To his credit, it has resulted in positive results on the pitch as Man City boast a 16-point lead at the top of the Premier League table while they booked their place in the League Cup final and remain in the hunt for the FA Cup and Champions League this season. However, as per CIES Football Observatory, they have spent the most on assembling their current squad out of every club in the Premier League, with a whopping €878m being splashed out. Unsurprisingly, with the exception of Everton who have endured a disappointing campaign this year, the level of spending from the top clubs has naturally been reflected in their positioning in the table with Man Utd, Chelsea, Liverpool, Arsenal and Tottenham forming the top seven biggest spenders in the findings. As a result, aside from some who will use this as ammunition against Guardiola for splashing out in order to get City to the position they’re currently in, it could perhaps also form part of the argument that the gulf in the Premier League comes down to the big clubs making the most of their financial muscle and causing a disparity with the rest of the league. United have spent €747m on their current group to earn second spot, Chelsea grab third having splashed out €592m, it’s €461m for Liverpool while Arsenal complete the top five with €403m. Spurs have spent just €358m in comparison, which will undoubtedly earn them plenty of praise for bringing through the likes of Dele Alli and Harry Kane. 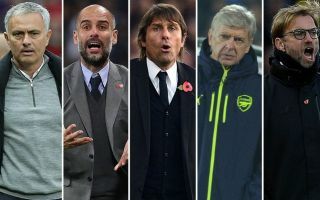 It’s down to the likes of Guardiola and Jose Mourinho to put all the pieces together, and it isn’t easy especially in the former’s case given the style of football that he’s got his side playing. Nevertheless, it surely offers a helping hand when you can boast the most expensive squad in Europe in terms of how much it has cost to recruit the current players available, and so it remains to be seen if that directly correlates into success both in England and in Europe for Guardiola and Man City.